Fun Winter Activities for all Generations! | Hokkaido Treasure Island Travel Inc.
Fun Winter Activities for all Generations! This is a fun rural adventure packed with delicious Hokkaido food, laughter and exciting snow activities every generation can appreciate! We put together an itinerary where you get to enjoy the beautiful winter even at the end of the season: March and April! Get ready for sledding on a steaming volcano, fishing for smelt fish on a frozen lake, dog sledding and many other of our own original programs that you cannot experience elsewhere! We’ve also worked in lots of kid friendly activities that will definitely stir up curiosity and excitement in your kids. Be amazed at the excellent weather conditions in March and April, which is actually a great time to enjoy snow activities in Hokkaido as there is still plenty of snow with the benefit of more sunny days in the weather forecast! Highlights are programs at Mt. Asahidake, the tallest mountain in Hokkaido, and our original programs in the outskirts of the town of Iwamizawa. Aside from that there’s so much more to experience as a family: fun cooking activities, shopping, delicious Asahikawa ramen, the Shiroi Koibito Chocolate Factory and more! Welcome to Hokkaido! Today’s itinerary will be designed according to your arrival time. 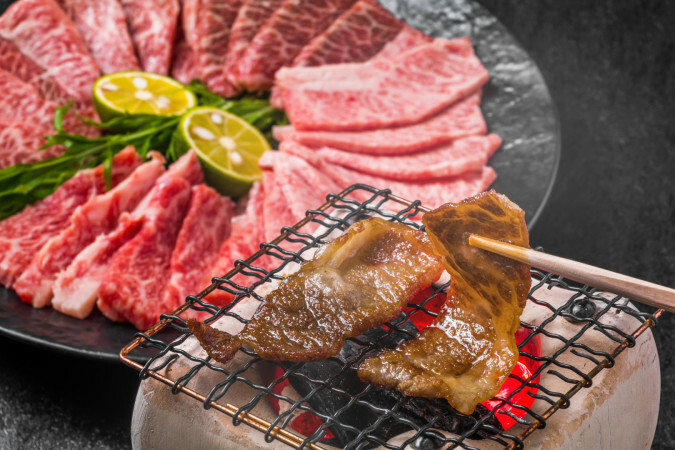 We hope to take you out for a delicious Wagyu (Japanese Beef) lunch, stop by an ice cream shop for dessert. We will head to Minami Furano, which lies in the center of Hokkaido, and is surrounded by wonderful nature. Finish the day with a delicious dinner at your stylish log cabin hotel and enjoy relaxing in the warm atmosphere surrounded by wood and nature. Get ready for the ultimate winter adventure! Today you can try dog sledding or smelt ice fishing! Drive your own team of sled dogs on a trail stretching out across a snow-white horizon! After brief instructions, you’ll have some time to communicate and have physical contact with the dogs, which is very important for building a bond before your journey. Feel the power and stamina of the Alaskan Huskies as you make your way through the crisp climate and stunning surrounds. Smelt ice fishing is just as fun! Meet your experienced local guide who will show you how to heat your tent, drill a hole in the ice, fish for smelt and make tempura on the spot with what you catch! Enjoy your classic Hokkaido winter experience! The kids will love these activities! Finish the day with a stroll through one of the most photogenic evening spots in Furano! The place is called, “Ningle Terrace,” a beautiful collection of boutique cottages, housing specialty arts and crafts along with their creators. Bring a nice camera! Welcome to Taisetsu National Park, one of the most powerful landscapes in Hokkaido. It is the largest National Park in Japan, and hosts the highest mountain in Hokkaido: Mt. Asahidake. After breakfast at your hotel, meet your nature guide and get ready for some light trekking in snow shoes to an open area for a fun sledding activity! Enjoy playing in the snow and bonding with the local people. March and April is a great time to enjoy snow activities in Hokkaido as there is still plenty of snow with the benefit of more sunny days in the weather forecast! Finish the day with an evening tour on the Asahidake ropeway looking down on the vast scenic landscape of snowcapped trees. Mt. 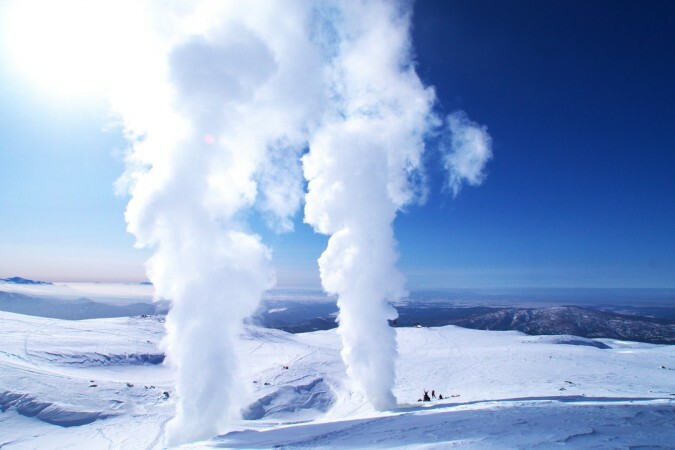 Asahidake is the tallest mountain in Hokkaido, and an active volcano with steam and snow-white smoke spewing from the earth’s core! On the way to your hotel, we’ll stop by the well-known mysterious blue pond in Biei and the spectacular Shirahige Waterfall. Finish the day with dinner at your hotel and a well-deserved relaxing time in the hot springs. Our first stop today is the Asahiyama Zoo! Have fun viewing polar bears, hippos, monkeys, as well as lots of wildlife from Hokkaido, including deer, eagles, cranes and wolves! 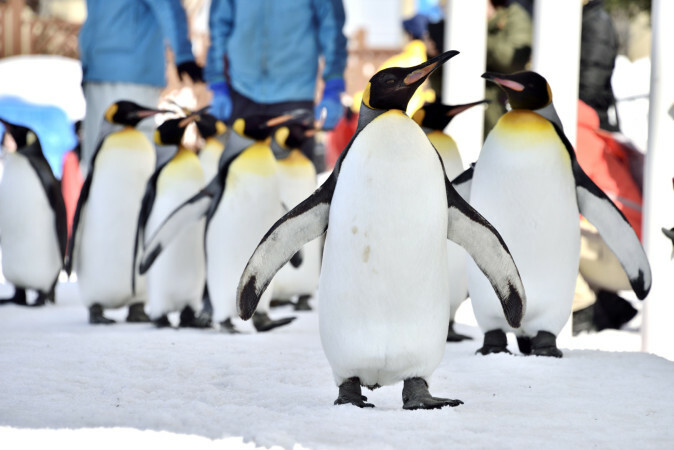 You may even get to see “The Penguin Walk,” where the penguins take a stroll around the park for exercise. You’ll see them waddle, slip and bump into each other, which is probably one of the cutest things you’ll ever see! After a wild time at the zoo, make your way to an interesting collection of ramen shops called, the “Asahikawa Ramen Village,” where eight of the most famous ramen restaurants in Asahikawa have opened up small shops besides one another. This savory ramen is known for its thin wavy noodles and shoyu (soy sauce) based broth. We recommend ordering toppings to go with it, such as green onions, pork, and bamboo shoots. You’ll love it! Finish the day in the outskirts of the small nostalgic town of Iwamizawa, where you’ll get to have a warm family campfire while being surrounded by nature. Enjoy the wooden architecture of the local lodge and have a relaxing time in the hot springs. After checking out of your hotel, get ready for a countryside experience with some friendly locals and learn how to make Baumkuchen (sweet roll cake). This is quite a special opportunity for your family to bond and enjoy a true local experience. Next stop, Sapporo! You’ll love the scenic route as we drive through the countryside and enter Sapporo, the capital city of Hokkaido. For lunch, you’ll get to experience making your own sushi with some of the freshest seafood in all of Japan! 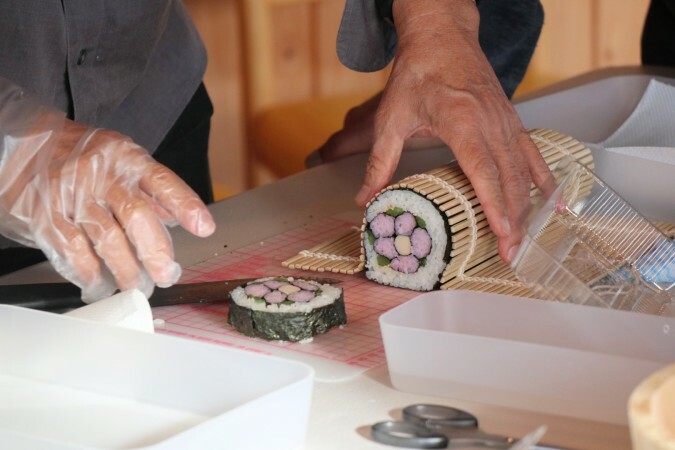 Learn about the fish and the traditional molding techniques from a professional sushi chef and be amazed at what you can create! Your last stop of the day is the Shiroi Koibito Chocolate Factory! Enjoy the romantic English architecture and atmosphere with the outdoor area beautifully illuminated until March 31st. The kids can even join a workshop where they can make their own cookies! Enjoy a free and easy day in Sapporo or take the JR Train to explore the nostalgic port town of Otaru! Old bank buildings and warehouses are still left from the times when this town thrived of herring fishing. Have fun walking around the famous Otaru Canal, Sakai Machi Street, Music Box Museum, glass blowing shops, the LeTAO Cheesecake headquarters, and many more one-of-a-kind spots. If you decide to stay in Sapporo, the kids can try the “Ninja Do!” They’ll get Ninja training and be able to dress up in Ninja costumes for some really cool photos! There’s also a shop where you and your whole family can get styled up in traditional Japanese Kimonos for a memorable family photoshoot! Enjoy Hokkaido’s recently revamped airport, which is a remarkable destination all on its own. Get ready for an abundance of Hokkaido made delicacies, which make great souvenirs! 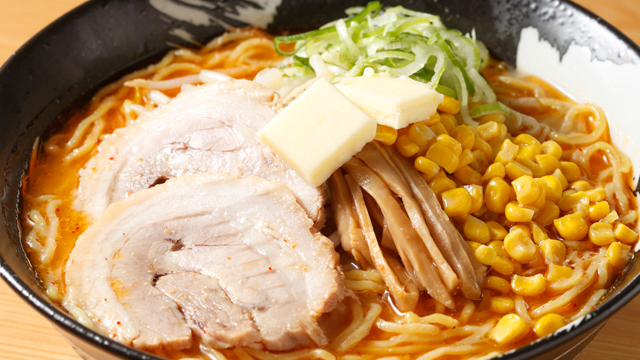 There are also many attractions such as a movie theatre, onsen, Doraemon Waku Waku Sky Park, which is really popular among the kids, and a Ramen Dojo, which houses 10 of the best ramen establishments from all over Hokkaido, each with their own signature style. We hope you had a wonderful winter journey on Treasure Island and look forward to seeing you again soon!